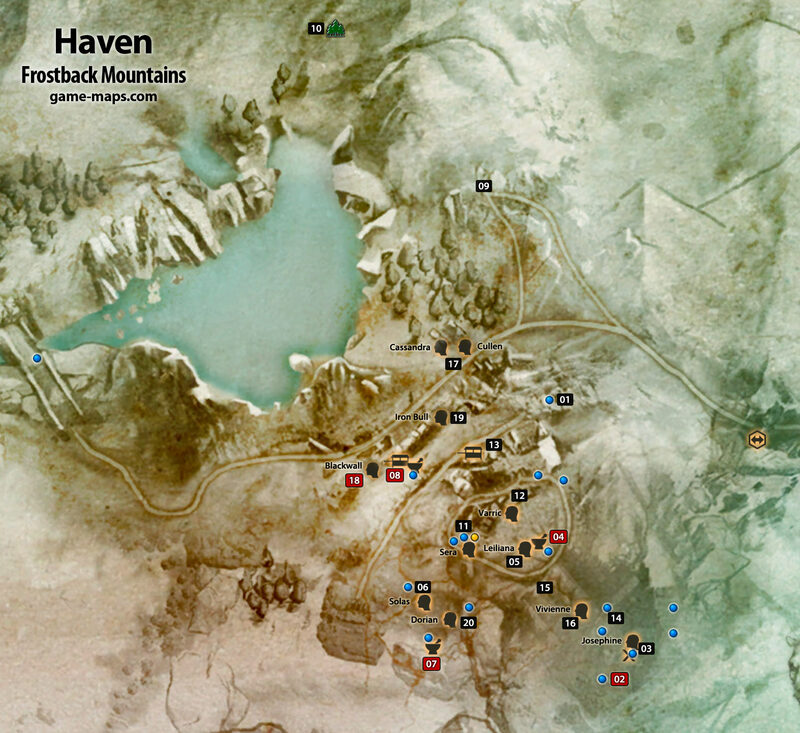 Frostback Mountains Haven - Dragon Age: Inquisition Walkthrough, Game Guide and Maps, with Quest and Locations of Camps, Merchants, Rifts, Ocularums, Astrarium, Dungeon Entrences, Landmark (POIs), Crafting Station, Mosaic Piece, Inquisition Agent, Secrets, Party Members, Bottle of Thedas and Codex Entry. Here you can start your adventure as a Leader of Inquisition. After dialogue go to (02) again. Here you can fulfill Inquisition Requisitions. ITEM: The Tactician's Renewal - you can buy single use item to respec your skills. First one for 1 coin. Use "V" few times inside house. Listen to singing Bard, exit and enter again few times for various songs, they gives Codex Entries. ITEM: Upgrades for Bianca Varric crossbow.